Autodesk Inc., a world leader in 3D design software for entertainment, natural resources, manufacturing, engineering, construction, and civil infrastructure, has released an update (SP1) to Maya 2018. 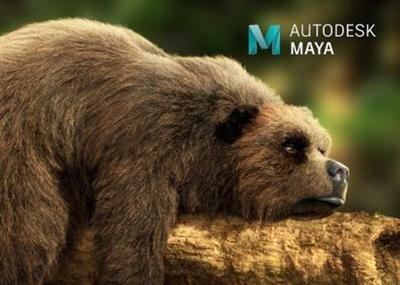 Bring your imagination to life with Autodesk Maya 3D animation, modeling, simulation, and rendering software. Maya helps artists tell their story with one fast, creative toolset. MAYA-85426 Wire deformer twist no longer causes partial rebind. MAYA-84912 Decompose Matrix node no longer ignores inputRotateOrder. MAYA-86017 Graph Editor : You can now manipulate points on a motion trail with the Graph Editor open. MAYA-84902 GraphEditor : Deleting keyframes from a referenced file no longer causes Maya to crash. MAYA-85898 Motion Trails : Translating keys on Motion Trails has been made easier. MAYA-85878 Constraints: Parent constraint's lock output now works correctly. MAYA-85516 Constraints : Creating tangents now works correctly. MAYA-85333 A regression in Python keyframe command since Maya 2017 Update 3 has been fixed. MAYA-85130 The Deform menu no longer recreates itself each time it is displayed. MAYA-85065 The Wire deformer's Dropoff distance is now limited correctly in both the Attribute Editor and ChannelBox. MAYA-84943 Infinity values on curves no longer cause Maya to hang when trying to copy keys. MAYA-84507 Playback performance improved on scenes with many constraints. MAYA-84420 Scrubbing timeline in scenes where meshes have no UV assignments no longer causes Maya to crash. MAYA-85332 Paths in sys.path are now added in order. MAYA-85264 QT Designer included in Maya now launches correctly. MAYA-81014 Using QtWebEngineWidgets in PySide2 no longer causes instabilities. MAYA-85327 Referenced fbx file now loads after being moved. MAYA-85840 Selecting NURBS Curves in Component Mode no longer causes Maya to hang. MAYA-85767 Boolean operations properly create supporting edges. MAYA-85641 Changing propagation in Use Constraints Options no longer causes Maya to crash. MAYA-85490 Sculpting on high valence mesh no longer causes Maya to hang. MAYA-85478 Sculpting a mesh with Volume Falloff and Topological Symmetry no longer causes Maya to crash. MAYA-85060 Weld certain vertices using the Target Weld tool is now more consistent. MAYA-85057 Enabling Quad Draw no longer slows down Maya with certain meshes. MAYA-85050 UV layout no longer updates to different location when UV is moved or new UV Set is created. MAYA-85042 Multi-cut Slice is now properly constrained in vertex mode. MAYA-85825 MASH Dynamics : All channels in Channel Random now working. MAYA-85179 MASH : Fixed a memory leak when playing / scrubbing the Time Slider. MAYA-84123 The issue where the Color Chooser, when in RGB mode, incorrectly changes the value of an unselected material is now fixed. MAYA-70361 Previously, if you choose not to install Arnold for Maya, a warning appears upon starting Maya or starting a new scene, indicating that the Maya Software renderer will be used instead. You can now prevent this message from appearing again by setting the environment variable MAYA_NO_WARNING_FOR_MISSING_DEFAULT_RENDERER=1. MAYA-84905 All nodes that have a Color attribute are color managed by default. This includes the file texture node, image plane node, and others. You can disable color management by selecting Raw as the color space, and enabling Ignore Color Space File Rules. MAYA-86189 Hotbox no longer pops briefly at the top left of the monitor in some Windows configurations. MAYA-86014 Hotkey Editor : Add to Recent Commands List feature now works correctly. MAYA-85877 Can change the active viewport by clicking the menubar in the Viewport. MAYA-85766 Floating Attribute Editor or Channel Box appears in front of other floating windows when using assigned � open windows � hotkeys. MAYA-85429 Mac : Minimized floating panels no longer appear on top of other apps. MAYA-85663 MPxDrawOverride::excludedFromPostEffects() no longer affected by Depth of Field in Viewport 2.0. About Autodesk Maya 2018. With new enhancements and an ongoing focus on stability, Autodesk Maya 2018 software helps artists work faster and more efficiently than ever. Over the past few releases, Maya has continued to push the boundaries when it comes to character creation with updates to modeling, animation, and new interactive grooming workflows. In addition to characters, the motion graphics workflow in Maya continues to mature with growing capabilities that now includes rigid-body dynamics. When it comes to rendering, the combination of Render Setup and Arnold provides artists with a powerful rendering solution that can tackle the toughest projects. Autodesk Maya 2018.1 Update | 1.6 Gb download links are provided by Extabit Rapidshare Uploaded Rapidgator Netload Bitshare Freakshare Letitbit Dizzcloud and more.